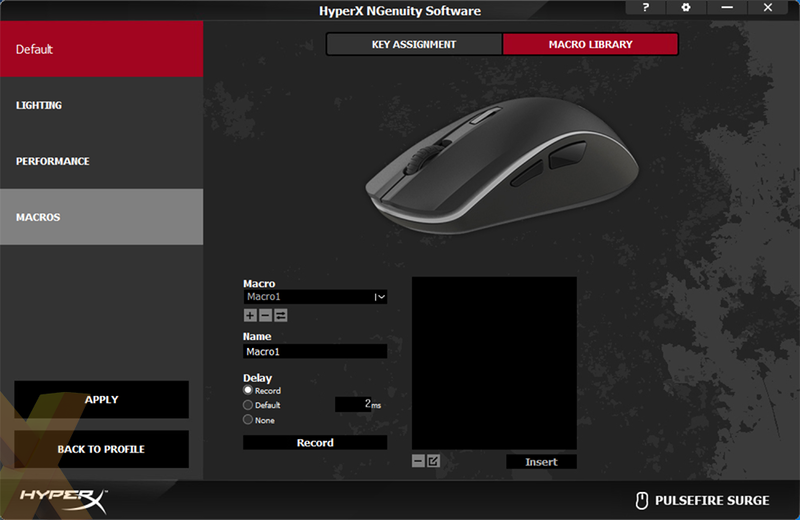 HyperX has been on something of a hot streak of late. The Kingston subsidiary is best known for its award-winning gaming headsets but has branched out with an array of peripherals that have, for the most part, been well received. 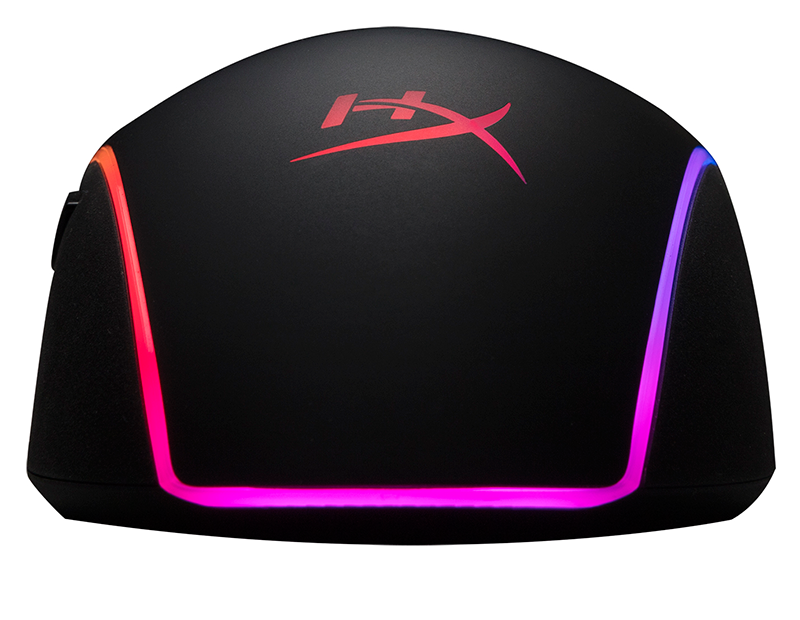 We enjoyed the firm's first multi-colour keyboard, the Alloy Elite RGB, and you won't be surprised to hear that there's now an RGB mouse to go with it in the form of the HyperX Pulsefire Surge. Priced at £60, Pulsefire Surge doesn't attempt to reinvent the wheel but offers a high-performance optical sensor in a symmetrical form factor that's particularly easy on the eye. 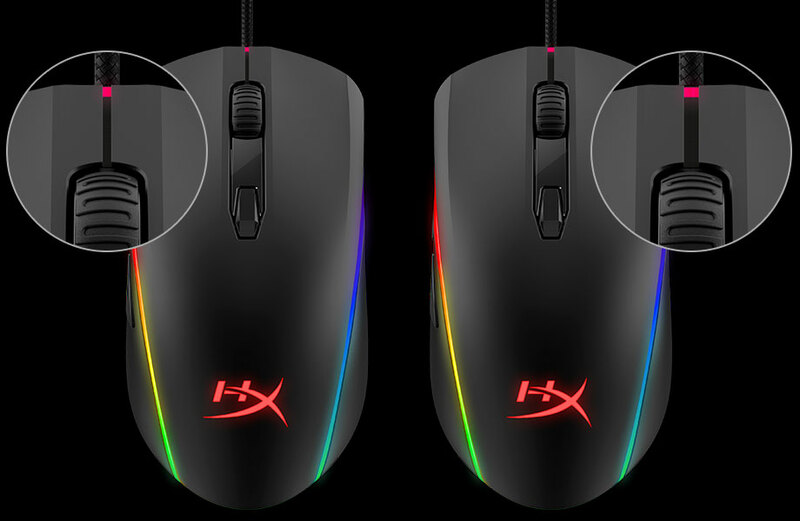 RGB lighting has clearly been prioritised by the HyperX design team, but that's no bad thing; this is one of the prettiest mice we've seen. 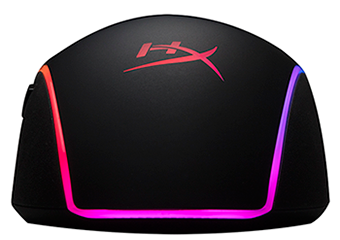 The 360° light ring surrounding the body is particularly well implemented, with some 32 RGB LEDs helping maintain even illumination, and the HyperX logo on the bump is backlit, too. 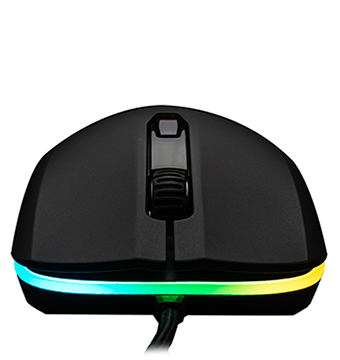 We're surprised not to see any illumination on the scrollwheel, but this is nonetheless one of the best examples of RGB lighting on a mouse, if that's your thing. Looking past the glow, the attractive design extends to its entire body. The smooth black top has a nice matt finish, while the sides are subtly textured to give the right amount of grip without feeling sticky. It's a sleek-looking pointer, with a 1.8m braided USB 2.0 cable and six buttons that blend in elegantly. Turn off the lights, which are set to a wave effect by default, and you wouldn't necessarily know that this is a gaming peripheral. We like the way it looks, and we quite like the way it plays, too. 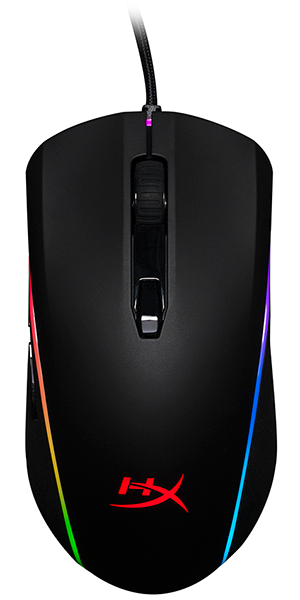 You tend to know a comfortable mouse as soon as you lay hands on it, and for my long, slender digits, Pulsefire Surge is a very good fit. Dimensions of 120mm (L) x 41mm (H) x 63mm (W) feel particularly well suited to a claw-style grip, though the 100g weight won't be for everyone; fast-paced gamers might prefer something a little lighter. Keeping to a sensible layout, Pulsefire Surge has tried-and-trusted Omron switches backing the left and right buttons, two thumb buttons on the left side, a clickable and notched scroll wheel, and a DPI toggle switch. All of the buttons are within easy reach and the DPI toggle is neatly recessed to avoid accidental hits. So far so good, but there's a problem. See the gap between the left and right buttons? It's a tad too small, and if you're aggressively clicking away, the two buttons can occasionally rub against one another. We've only experienced the clash once during actual gameplay, but that's beside the point, it should never happen and we're surprised this flaw has slipped through unnoticed on a retail product. The problem has been deemed severe enough to halt sales, but we're encouraged to see HyperX taking a proactive approach. 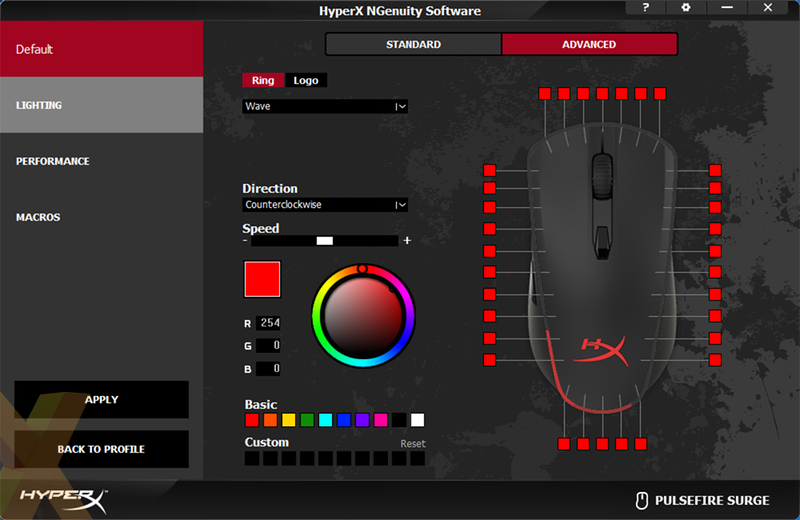 A hardware revision, due to arrive in roughly six weeks, will feature a wider gap between the two main buttons to eliminate the issue, and in the meantime early adopters can request a replacement via hyperxgaming.com. 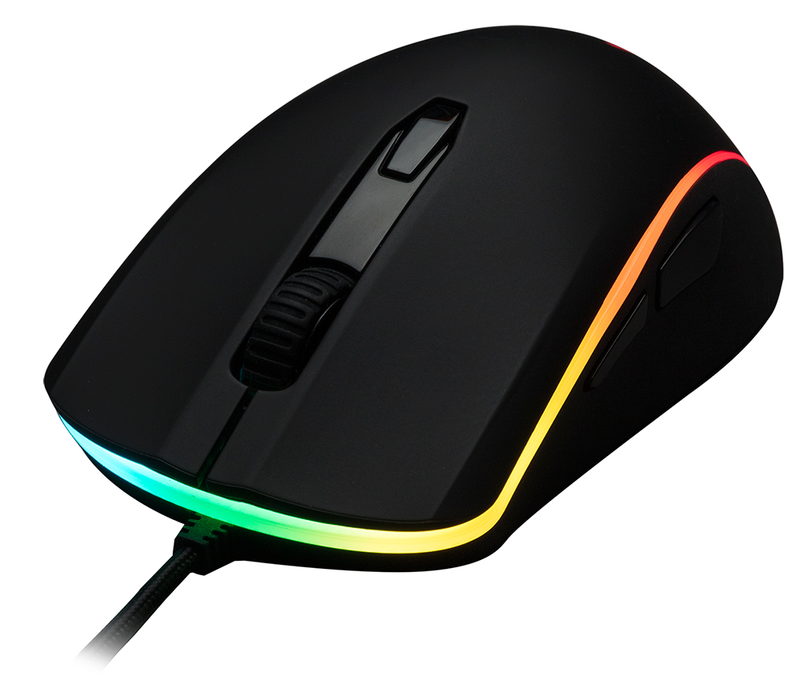 Pulsefire Surge could be remembered as the device that favoured superfluous RGB lighting over buttons that work as intended, but that would be a shame as it's a highly capable mouse pending the upcoming fix. On the underside, sandwiched between two extra-large Teflon pads, is a Pixart PMW3389 16,000 DPI optical sensor that happens to be one of the best in the business. 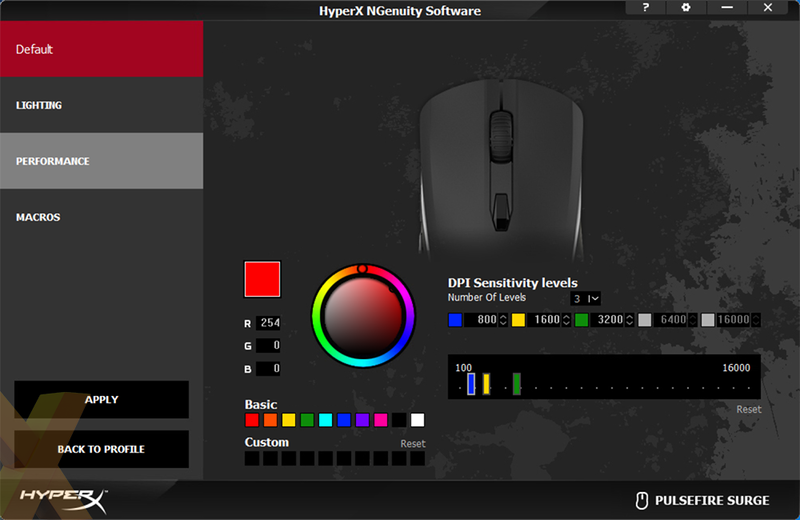 Sensitivity is configurable in 50 DPI increments, and up to five default levels can be configured, three of which are predefined at 800, 1,600 and 3,200. 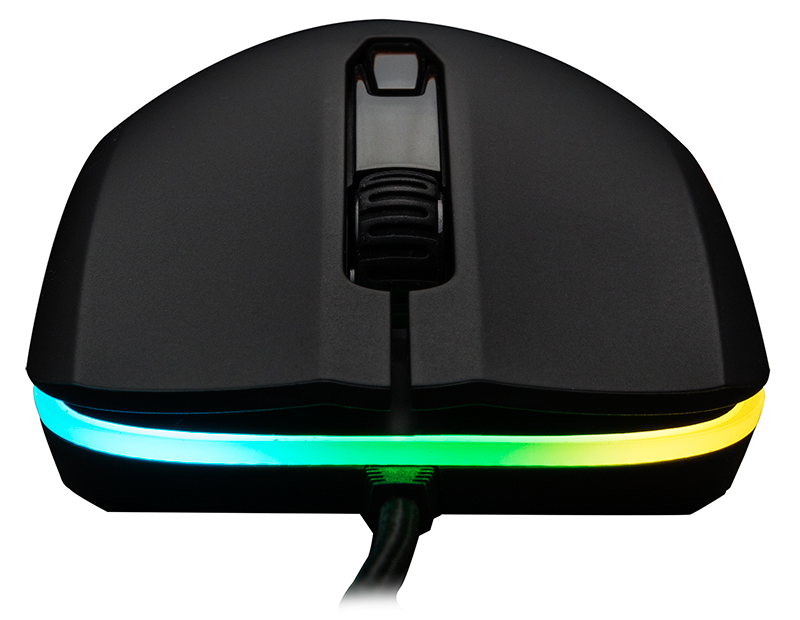 We like the fact that the RGB ring changes colour briefly to let you know which DPI setting is in use, and performance is excellent during real-world use, with top-notch precision and no sign of jitter. The hardware has promise, however the software isn't quite as robust. 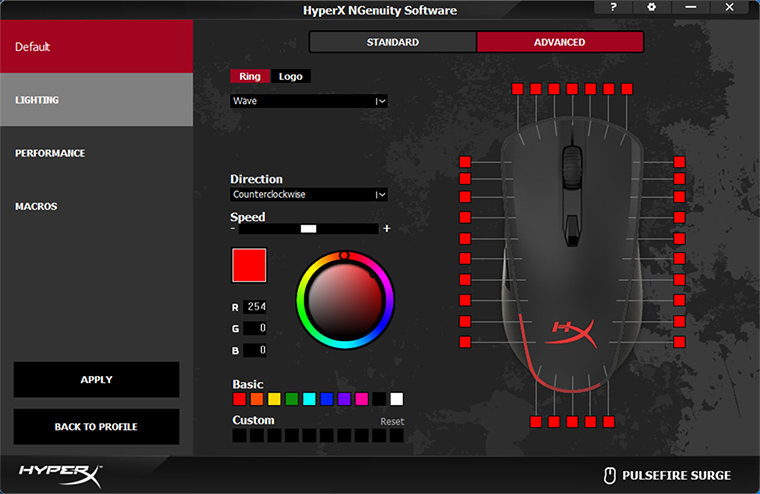 The free-to-download NGenuity app caters for various HyperX peripherals, but creating custom lighting effects feels like a chore, and isn't yet as advanced as say, Razer Chroma. There's room for the app to develop, yet button mapping is easily managed, as are macros, and there's enough onboard memory to store up to three custom profiles. 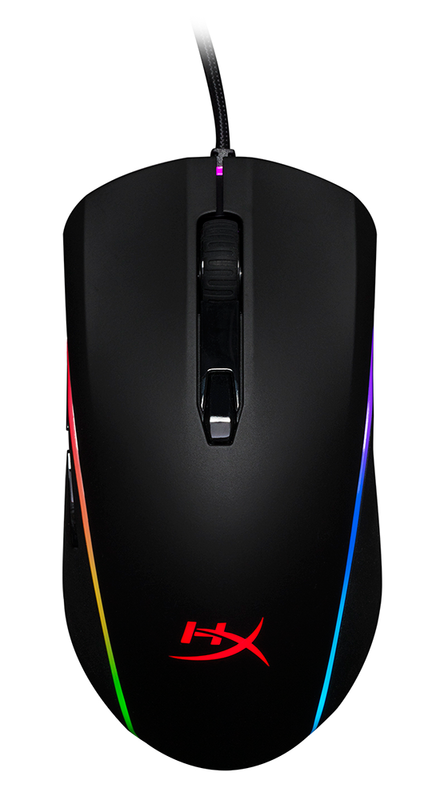 ...a high-performance gaming mouse that's comfortable, precise and very easy on the eye. Pulsefire Surge cuts a lot of the frills to deliver a high-performance gaming mouse that's comfortable, precise and very easy on the eye. 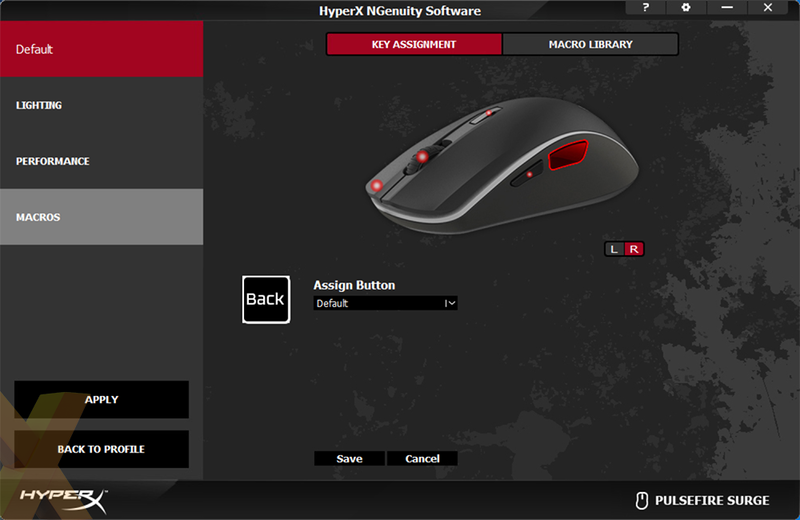 Gamers seeking niche features such as weight adjustment, customisable scroll-wheel resistance or an excess of buttons will have to look elsewhere, but if you prefer a simpler, more traditional pointer then HyperX has you covered. Bottom line: there's room for improvement on the software front, and retail availability has been pushed back a month or two while HyperX fixes the unexpected flaw, but given the profile, high-end sensor and super-sleek RGB ring, Pulsefire Surge could be worth the wait.